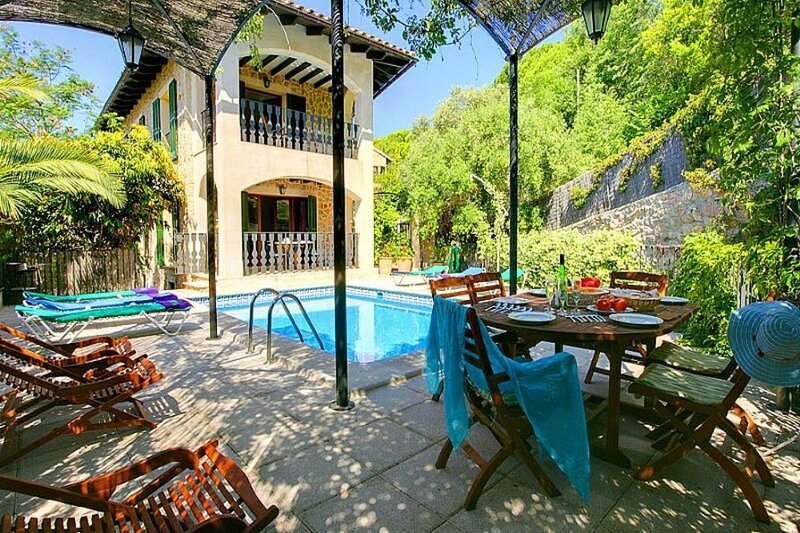 Valldemossa, is a town on the island of Mallorca 17 km from the capital Palma de Mallorca. The town is situated in an elevated position, which forms part of the valley known as Sierra de Tramontana. This area is full of olive and almond trees, is rich in springs and is enveloped by lush, abundant vegetation ... you cannot help but feel the calm and relaxing atmosphere provided by such surroundings. They really do offer a uniquely special charm, with steep and narrow streets winding up into the valley. The property is housed in the town which is the birthplace of St. Catherine Thomas; the centrepiece is the XIII century church, which went through an extensive renovation in the eighteenth century. La Real Cartuja de Valldemossa is the central point of interest, both for its architectural features and the fact that in the 1838-39 period Chopin and George Sand lived. During the stay on the island George Sand wrote a book about his experiences bittersweet "A Winter in Mallorca", which has become a cult book and reading almost a must if you are curious to see how life was in the nineteenth century Valldemossa. The monastery was inhabited by Carthusian monks from the fourteenth to the nineteenth century and houses various cells in which documents, books and furniture related to the Order of St. Bruno are stored. Its museums show the historical and artistic legacy of the Carthusians. The pharmacy is wonderful and it houses ancient medicinal preparations in a collection of 135 cans of Catalan ceramics of the period. In addition to these distinguished guests, Ruben Dario, Jovellanos, Santiago Rusiõl also spent time in the monastery. We hope that you will honour us with your own distinguished presence at our Villa in Valldemossa.